Hari Kemerdekaan (Indonesian for: "Independence Day", complete: Hari Kemerdekaan RI[i], colloquial: Tujuhbelasan[ii]) is a national holiday in Indonesia commemorating the Proclamation of Independence of Indonesia on 17 August 1945. Several ceremonies and festive events were held throughout the country to celebrate this national day; including flag hoisting ceremony, local games and competitions held in the neighbourhood, patriotic and cultural parades, and also discounts offered by participating shopping centres or businesses. During this day, most of Indonesian televisions were broadcasting the National Independence Day Ceremony live, held in Merdeka Palace in the capital. Televisions were also often airing Indonesian patriotic songs, nationalistic-themed films, advertising and talkshows. Republic of Indonesia Law Number 24 of 2009 concerning National Flag, National Language, and State Symbols and National Anthem article 7 paragraph 3, regulates the obligation to raise the Red and White flag for every Indonesian citizen in their households, public institutions, office buildings, educational institutions, public transportations, and private transportation in the country, as well as Indonesian diplomatic offices abroad, on August 17. However, every households usually already raised the Indonesian national flag several days prior the 17th of August, some weeks earlier, or encouraged to raise the flag throughout the month of August. Citizen usually raised the national flag using modest bamboo pole by the fences in front of their homes. During this month neighbourhood is usually festively decorated with rows of small flags or traditional umbul-umbul banner in national colors of red and white. Also the entrance into the kampung, residence compounds, street or alleys are adorned with gapura gate, usually made from plywood, painted and decorated with nationalistic themes. 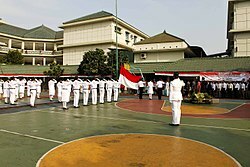 A national formal flag hoisting ceremony is held in Merdeka Palace in Jakarta, hosted by the current Indonesian President, reenact the declaration of independence proclaimed by Sukarno and Hatta back in 1945, held in 10.00 a.m. in the morning. Certain distinguished guests and VVIPs were invited to attend this prestigious national ceremony in Merdeka Palace; including ambassadors and diplomatic guests, former Indonesian presidents, vice presidents and ministers, prominent figures in Indonesian politics, economy and business, cultural figures including artists and celebrities, also veterans. Other than this certain prestigious national ceremony held in the national capital hosted by the president; every government institutions and offices, educational institutions (i.e. schools, universities), also some private offices, may held their own flag hoisting ceremonies in their offices to commemorate the national independence day, about the same time at 10.00 a.m. in the morning. The Hari Kemerdekaan is an important public holiday in Indonesia, and expected to be celebrated by the whole of Indonesian people locally in their cities and villages, also abroad. Colloquially called by locals as tujuhbelasan or 17-an which means "seventeenth" in Indonesian, it is a joyous celebrations, as after the flag ceremony in the morning, in the afternoon locals usually held various games and competitions for children and adults alike in their neighbourhood. During Independence Day, several parades or carnivals, were took place on avenues or streets in the cities or villages across the nation. They might took form as modest carnival, organised by local community, where children and sometimes adult sporting patriotic cosplay, cultural parade such as wearing baju adat or traditional ethnics costumes, and also decorative bicycles usually performed by children. Some larger parade might be held and organised by provincial, regency or municipal government, staged in main avenue of the city. The national main parade called Karnaval Kemerdekaan however, is usually does not took place in 17th of August, but in the next Sunday morning after the independence day. The parade and carnival usually featuring marching bands, decorative floats, patriotic parade and cultural carnival featuring traditional costumes of various ethnic groups of Indonesia. They usually started in Merdeka Square by the National Monument, parading through capital main avenues; Thamrin and Sudirman avenues, passing Selamat Datang Monument and Gelora Bung Karno Stadium complex. In recent years however, the main national Karnaval Kemerdekaan were not staged in national capital, but distributed to provinces with regional cities took turns on hosting this national event. In 2017 for example, the national independence carnival were staged in Bandung, West Java. Wikimedia Commons has media related to Indonesian Independence Day. ^ RI stands for Republik Indonesia. ^ The Carnival was performed a month earlier in July and merged with Asian Games Carnival in Jakarta, since the event was held in the same time with Asian Games 2018. ^ "Independence Day 2019 and 2020". PublicHolidays.co.id. Retrieved 2019-04-04. ^ Post, The Jakarta. "Jakartans celebrate Independence Day with parade". The Jakarta Post. Retrieved 2019-04-04. ^ Post, The Jakarta. "Big discounts offered to commemorate Independence Day". The Jakarta Post. Retrieved 2019-04-04. ^ DH, Agung. "Karnaval Kemerdekaan Pesona Parahyangan Digelar 26 Agustus". tirto.id (in Indonesian). Retrieved 2019-04-05. ^ Media, Kompas Cyber. "Siang Ini Karnaval Kemerdekaan Digelar di Bandung". KOMPAS.com (in Indonesian). Retrieved 2019-04-05. ^ Wijanarko, Tulus (2018-07-02). "Sambut Asian Games, Jakarta Segera Gelar Karnaval Budaya". Tempo. Retrieved 2019-04-05. ^ a b c d Media, Kompas Cyber. "Infografik: Logo Peringatan HUT RI di Era Pemerintahan Jokowi". KOMPAS.com (in Indonesian). Retrieved 2019-04-05. This page was last edited on 10 April 2019, at 17:46 (UTC).